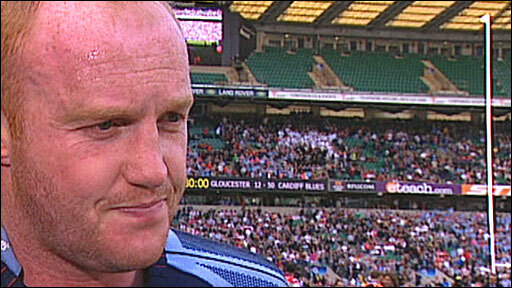 Cardiff Blues won their first silverware as they totally outplayed Gloucester to lift the EDF Energy Cup. Two sparkling Leigh Halfpenny tries helped the Blues take an early 17-0 lead at Twickenham. Gloucester got on the board through Mark Foster but a fine Tom James score made it 22-5 at half-time. After the break Ben Blair scored a double of his own and Ceri Sweeney and Tom Shanklin also crossed, with a Gloucester penalty try no consolation. The Blues - born out of the venerable Cardiff club when Welsh rugby moved to the regional model - went into the game chasing silverware on two fronts following last weekend's Heineken Cup quarter-final win over French aristocrats Toulouse. It was their first final since becoming a region in 2003 but they showed no sign of nerves and dominated from the first whistle, winning the collisions and showing plenty of enterprise with ball in hand. With just a minute on the clock they mounted a surging attack and after powerful carries from Taufa'ao Filise and James, Halfpenny was just kept out as he tried to cross in the corner. It was a scintillating start to the match for the Welsh side and, although they suffered a blow as scrum-half Jason Spice went off with a broken arm, they soon took the lead with a quite brilliant try. After the forwards had bludgeoned their way upfield Nicky Robinson made a superb break and fed Shanklin, who found Halfpenny roaming off his wing. The young Wales star fed replacement scrum-half Richie Rees and his sublime pass out of the back of the hand gave Halfpenny the space to race over behind the posts. Blair converted and, after Halfpenny had again threatened, the former All Black landed a penalty to give the Welsh side a 10-0 lead. Halfpenny was buzzing about the ball like a wasp around a picnic and he soon stung Gloucester a second time after Jamie Roberts and Shanklin combined in midfield to rip open the Gloucester defence following an initial Xavier Rush burst. The ever-present Martyn Williams was on hand to play the link as a classic open-side should and he had the vision to ignore the obvious pass to the supporting Filise, who was covered, and pass outside to arch-finisher Halfpenny. Blair slotted his second conversion and although there was an hour to play the engraver had already started putting the Blues' name on the trophy. The Cherry and Whites had been battered but they showed some fight as Foster finished off a sweeping move on the half hour mark. But the Blues were just too good and went further ahead when James produced a remarkable finish, dotting down despite being spun about in a grapple tackle by Ryan Lamb. 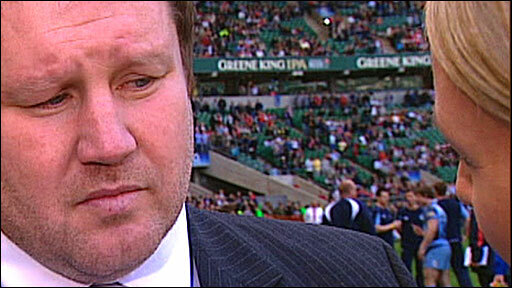 Blair could not convert but the Blues led 22-5 at half-time and they never looked like being overhauled. Some brave Gloucester defence kept them scoreless for the first 25 minutes after the restart but the West country side had been forced to make twice as many tackles and they finally caved in. Blair scored his first after a slashing break from Robinson had been carried on by mobile loose-head prop Gethin Jenkins, and replacement Sweeney then latched onto a loose ball straight after coming onto the field for the second. Blair landed both conversions to make it 36-5 and although Gloucester's pack won a private battle to earn a penalty try after a powerful series of scrums, their side had long since lost the war. The Blues' heavy artillery had reduced the Gloucester defence to rubble and Blair and Shanklin ambled through the ruins to round off a marvellous day for the Welsh side. Gloucester: Morgan; Watkins, Simpson-Daniel, Allen, Foster; Lamb, R Lawson, Wood, Azam, Somerville, Brown, James, Narraway, Qera, Delve, Hazell. Replacements: Barkley for Lamb (60), Cooper for R Lawson (57), Nieto for Wood (65), Bortolami for James (52), Hazell for Qera (57), S Lawson for Hazell (61). Cardiff Blues: Blair; Halfpenny, Shanklin, J Roberts, James; N Robinson, Spice; Jenkins, G Williams, Filise, Davies, Tito, Molitika, M Williams, Rush. Replacements: G Thomas for Halfpenny (67), Sweeney for N Robinson (67), Rees for Spice (2), T Thomas for G Williams (61), Yapp for Filise (70), D Jones for Davies (65), A Powell for Molitika (58).